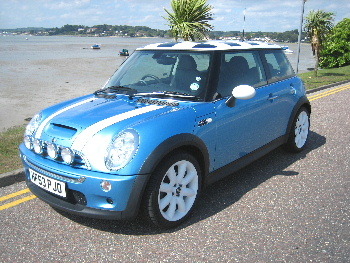 MINI Cooper S 1.6, 3 Doors, Manual 6 speed, Hatchback, Petrol, 2003 53 Reg, 20,000 miles, Electric Blue Metallic. 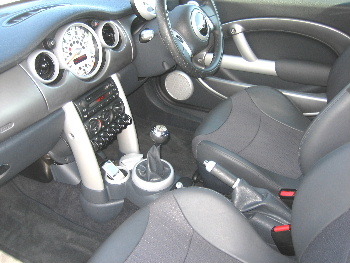 ABS, Adjustable seats, Adjustable steering column/wheel, Driver airbag, Electric mirrors, Electric windows, Head restraints, Folding rear seats, Immobiliser, Lumbar support, Passenger airbag, Power assisted steering, Remote locking,Speed sensitive CD/Radio, Side airbags, Rear headrests, Sports seats, Traction control. 17 X-Lite alloys,Satellite black half leather,Keyless entry/remote closure,Quad spotlights,Chilli-Pack,Air-Con,Xenon Lights,Anti dazzle mirror,Front fogs,Chequered roof,White mirror caps/Bonnet stripes,ABS-ASC+Traction-CBC-EBD,Bonnet scoop,Nokia prep,Man warranty,TLC pack (free servicing),Taxed,Also included in the sale will be a brand new in the box Snooper Indago Navteq Sat Nav system with speed camera detection, My wifes car sold immaculate !